The intelligent KOBOLD digital manometers are used for the display, monitoring and remote transmission of pressuredependent operating sequences in machines and installations. 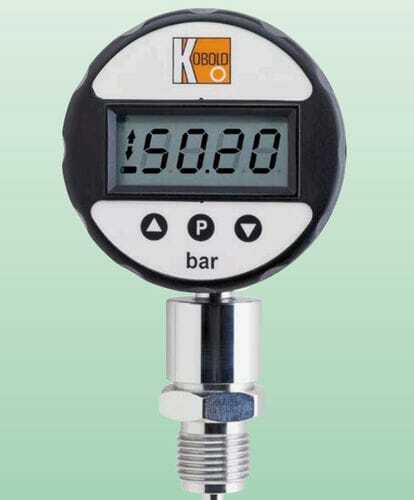 The pressure to be measured is sensed by a piezo-resistive sensor and displayed by the electronics. As an option, an analogue output signal for remote transmission of the measured values and a relay output are available. The values are shown on a four-digit LCD display. The front cover along with the display can be rotated. In the pressure switch design with integrated relay, the switching point and hysteresis can be set on the membrane keypad. The starting and end points of the optional analogue output, relative to the display, are freely scalable. A wide range of process connections is available as an option. The process connection can be rotated in axial direction as desired, after loosening the counter nut.